Is Christina Aguilera the Best Pop Singer in the World? And can she teach you everything she knows in less than 4 hours? Christina Aguilera has been wowing audiences for most of her life. She won her first of many local competitions in her home state of Pennsylvania at the age of 8 and then took second place on Star Search when she was 9. Here's a video of one of her performances. In 1993 when she was just 13 she joined the New Mickey Mouse Club along with future superstars Britney Spears, Justin Timberlake, Keri Russell, and Ryan Gosling. For the final two season of the show she captivated worldwide audiences with her natural ability to phrase and embellish melodies. After being featured on the Mulan soundtrack with the single "Reflection" in 1998, she was signed to RCA Records and released her first self-titled album in 1999 which sold over 17 million copies worldwide. Hit singles included "Genie in a Bottle" and "What a Girl Wants". She won the Grammy for Best New Artist in 2000. After releasing a Spanish language album ("Mi Reflejo") and a Christmas album ("My Kind of Christmas"), she felt that she was labeled as "bubblegum pop" and decided to reinvent herself with the release of her fourth album, "Stripped" which would go on to sell 13 million albums worldwide. It featured much more adult and sexier hard hitting singles including "Dirrty", "Fighter", and the more personal smash hit ballad "Beautiful" which won her a Grammy for Best Female Pop Vocal Performance. Other albums, singles (including "Lady Marmalade"), tours, a movie ("Burlesque") and numerous appearances followed but it was her time on The Voice that brought her back into the mainstream spotlight. She was able to mentor young upcoming singers in a way that was very satisfying to her desire to give back. She had learned so much about every aspect of the music business that teaching was the next logical step for her. It was for this reason that the producers of MasterClass.com approached her to become part of their roster. So now she's sharing all of her hard-earned wisdom from over two decades of super stardom in about 3 1/2 hours of video broken into 23 lessons which include a 47 page downloadable workbook and Range Finder Tool. We decided to pay the $90 and take the class. And boy are we happy we did! Not only does it come with a 30 day money back guarantee, it's the smartest money we can imagine investing in such a treasure trove of information. First off, here's a trailer! 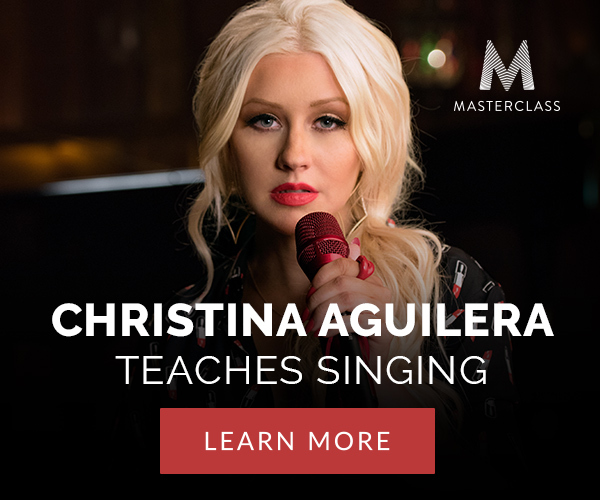 Join Her Masterclass Right Now!